NET Ministries is an international youth ministry that challenges young Catholics to love Christ and embrace the life of the Church. This mission is fulfilled through youth retreats across the country. To help young people understand and accept God&apos;s unconditional love for them. To offer the faith of the team members as a witness to the youth that faith in God is desirable, acceptable, and exciting part of their lives. To encourage young people to grow in their commitment to Jesus Christ and His Church. 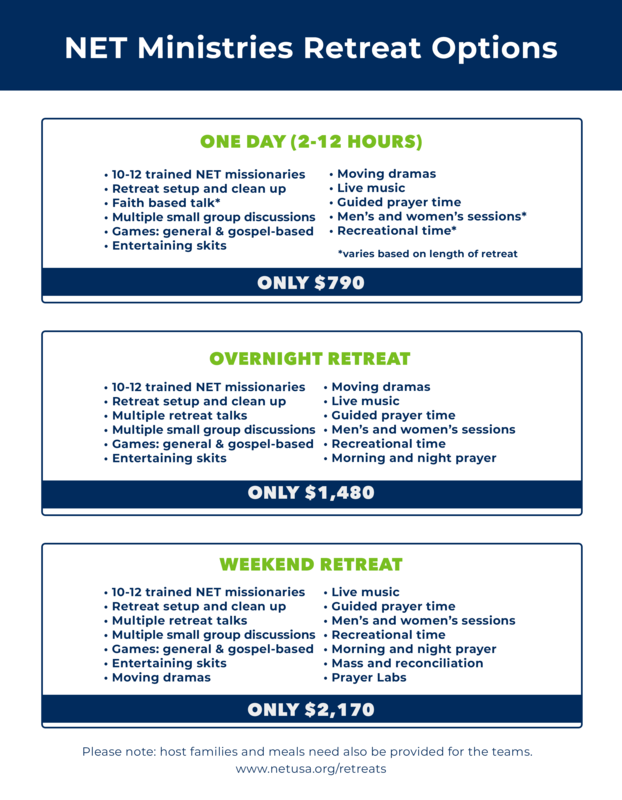 Included in your NET Retreat: Download the Retreat Fee breakdown here. NET Ministries depends on retreat fees* to continue operating as a ministry. When determining fees we must consider the cost of purchasing vans, vehicle insurance, gas, medical insurance for team members, administrative costs, training and supervision of team members, retreat materials, etc. NET Ministries will directly bill each parish/school hosting a retreat. Payment is due to NET Ministries no later than two weeks after the date of the retreat invoice.